American Airlines agents and supporters march to the NMB. American Airlines is still refusing to hand over mailing labels to the National Mediation Board so that passenger service agents can vote on union representation. So workers took matters into their own hands. On Tuesday, a group of agents and supporters hand delivered labels containing the names and mailing addresses of nearly all voting eligible employees to the NMB's general counsel, urging her to move forward on the union representation election for nearly 10,000 agents. "American Airlines employees must be afforded their right to choose union representation in a free election," CWA President Larry Cohen said in the accompanying letter to NMB General Counsel Mary L. Johnson. "The timing of the election is particularly critical in this situation, as American Airlines is in bankruptcy and is using that proceeding to make immediate, structural and life changing decisions about passenger service agents." But in papers filed Tuesday, American's parent company AMR responded that it won't hand over the labels while it contests NMB's decision to even allow the election. AMR is currently suing the agency to stop agents from voting. CWA and the passenger service group are intervening in the lawsuit that AMR has filed against the NMB, supporting the agency's position that the election should go forward. Last December, CWA filed a request with the NMB for an election, which was supported by more than 35 percent of workers, which was what the law required at the time. But as NMB worked to set an election date, Congress changed the law to require election requests to be supported by 50 percent of workers. The new law went into effect in February, two months after the agents filed. But AMR is seeking to rewrite aviation legislation and substitute its own agenda for that of Congress, so it can muzzle its employees and stop them from having a union voice. And despite US Bankruptcy Judge Sean Lane's decision not to issue a temporary injunction to bar American Airlines from implementing devastating wage, benefit and working conditions cuts for passenger service agents, agents and CWA supporters are pressing forward for a fair and timely election. 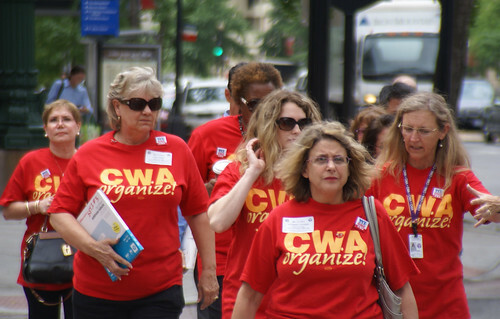 "American Airlines has been doing everything it can think of, both legal and not, to block agents from voting on union representation," said CWA Organizing Director Sandy Rusher. But agents are continuing to mobilize, sending petitions to the American Airlines CEO and to the NMB calling for a fair election now. Rep. Jan Schakowsky (D-Ill.) and members of the Illinois congressional delegation sent this letter to American Airlines CEO Thomas Horton, calling on him to respect workers' right to vote on union representation. Find more information at www.american-agents.org.